Day 01: Arrival. Transfer to hotel. Night in hotel. Day 02: Ho Chi Minh’s Mausoleum, One – Pillar Pagoda, Ho Chi Minh Museum, Quan Thanh Temple, The Literature Temple, The fine – Arts Museum or The Museum of History, Ngoc Son Temple, The Old Quarter. Evening: A Folk Show or Water puppet Show. Night in hotel. 4 N 1: Day trip to Tay Phuong and Thay Pagodas or Ruins of Co Loa Citadel and Dinh Bang Communal House. Back to Hanoi. Night in hotel. 4 N 2: Day trip to perfume Pagoda: Boatcruise on Yen Vi Stream. 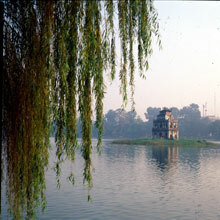 Visit Thien Tu, Tien Son, Giai Oan, Cua Vong and Huong Tich Pagodas. Back to Hanoi. Night in hotel. 4 N 3: Day trip to Ninh Binh. Visit Tam Coc Caves, Bich Dong pagoda, King Dinh and King Le Temples. Back to Hanoi. Night in hotel.